An expanded version of the lead article in our latest newsletter. Sept. 1980 Seattle Times article on whereabouts of missing clock. 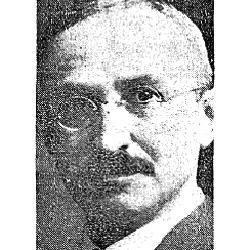 June 8, 1937--Joseph Mayer portrait from obituary in Seattle Times. Burnett Brothers clock on 1st and Columbia, Seattle. Don Bugh Collection. It could be coaxed into telling time and it also has surprising stories to tell of Lakewood, Seattle, and regional jewelers. It was first installed in Seattle in 1911. It came to Lakewood in 1998. You'd never guess what happened in between. A clock is made up of the attractive part you see, and the precision mechanism hidden away. The inside of the Colonial Center clock was made by E. Howard & Co. of Boston. The outside was made by Seattle's Joseph Mayer & Brothers. E. Howard was the top supplier of movements for tower clocks, and they also packaged the movements into popular street clocks. In 1906 they supplied the clock for King Street Station's tower in Seattle. That same year they sold new street clocks to Seattle jewelers Albert Hansen and Hardy & Co. The creative force behind the Lakewood clock's case design was Joseph Mayer, a German Jewish immigrant. He arrived in Seattle at age 16 in 1884, well before the Great Fire. In 1891 he and a partner opened their first business, Uncle Harris Loan Office, in the same Pioneer Square building as Donald Trump's grandfather's restaurant. Joseph's brothers Albert and Markus joined him and they established themselves as wholesalers and manufacturing jewelers in 1897. They supplied retail jewelers in town and throughout the region. Joseph Mayer & Bros boomed with the 1897 Yukon Gold Rush. They served an important role smelting and weighing raw gold in the years before the federal government established an Assay Office for the miners. In 1906 Mayer & Bros became local agents for E. Howard. The timing with King Street Station probably is no coincidence. Joseph Mayer sold a clock for Howard to L. W. Suter in 1906. Over the next three years he sold another dozen street and tower clocks in Seattle and Tacoma. They were well on their way to becoming the largest manufacturing jewelers north of San Francisco. In 1909 Mayer began manufacturing his own cases. This cut out the huge cost of shipping them across the country and allowed him to express his own design sense. He experimented with Seth Thomas movements but used mostly E. Howard. In 1914 Mayer began using movements that he designed and manufactured himself in Seattle. Mayer sold street clocks until jewelers ran out of money during the Great Depression. One of the last was the Carroll's Fine Jewelry clock now at Seattle's Museum of History & Industry, which dates from 1930. The Colonial Center clock comes from 1911, during Joseph Mayer's transition into manufacturing his own clocks. The movement is an E. Howard & Co. Model Number 0 with serial number 2720. The movement shipped from Massachusetts. But the case is a local product. 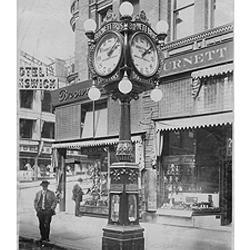 The clock was purchased by Burnett Brothers and installed in front of their store at First Avenue and Columbia Street in Seattle in 1911. The Burnetts were three brothers -- Louis, Simon, and Abe -- from a large Russian family. They immigrated to New York, then moved to Kansas and finally established themselves in Washington in 1898. Their jewelry trade grew each time. The first store in Washington was in Chehalis. From there they grew a regional jewelry empire. They opened branches in Centralia, Winlock, Castle Rock, Republic and Aberdeen. In 1905 they opened another store, this time in Seattle. It was at 720 1st Avenue, near the intersection with Columbia Street. Street clocks were prominent features at the Burnett stores. In Seattle they purchased Albert Hansen's old clock when he upgraded in 1906. The store was successful and the Burnetts secured a retail contract with Seattle's 1909 Alaska Yukon Pacific Exposition. Success in Seattle meant upgrades. First they replaced the street clock with the one now in Lakewood. They were granted permission to install it by the Seattle City Council in March 1911, and photographs show it on 1st Avenue in July. Then Burnett Brothers joined the commercial migration from Pioneer Square up 2nd Avenue in May 1912. They moved to 909 2nd Avenue, just north of Marion Street. Just a few doors down from them was Hardy & Co. with their E. Howard 4-dial. Across Marion was the Lichtenstein Brothers street clock, a pocket watch shaped 2-dial E. Howard. A photo of Hardy & Co. and Burnett Bros was featured in a recent Now & Then article by Paul Dorpat in the Seattle Times. The E. Howard street clocks were standard designs that could be seen in cities across the country. By contrast, Burnett Brother's Mayer clock was unique and set them apart from nearby jewelers. Only about ten were ever made by Mayer of which five survive. In 1926 Burnett Brothers moved with the clock to 1316 2nd Avenue (at University Street), and again in 1936 to 328 Pike Street (at 4th Avenue). All four corners of the 4th and Pike intersection had jewelers with clocks over the years. Ben Bridge remains today with their 90 year old clock on the southeast corner. Carroll's Fine Jewelry closed recently and their clock was moved from the southwest corner to MOHAI. The space in the Seaboard Building on the northwest corner that currently has Arcteryx was last a jeweler as Rivkins with a clock over their door. And at the same time as those three business, the northwest corner had Burnett Brothers and their clock. It actually used to be a five-cornered intersection when Westlake reached fourth. The fifth corner had clocks at times too. Of the many other street clocks that were at this intersection, only the former Young's Credit Jewelry -- now Earl Layman Street Clock -- remains, relocated to Pioneer Square at 1st and Main. The evidence leading to the next chapter of the clock's history is not explicit, so it's worth discussing how we can be so confident. For the last five years Paul Middents and I have been scouring archives for evidence of Puget Sound's street clock history. We have looked at thousands of digitized photographs, searched digitized newspapers and trade journals, reviewed clock manufacturing records, and flipped through city records to build out a new history of Seattle's street clocks. There are a handful of clocks of the same design as the clock in Lakewood. Most of them are accounted for. There's one in Vallejo, CA. One that was recently in Sonohomish, WA. Another in Victoria, BC. A twin clock in Tacoma was destroyed in the 1960s. There are only three or four clocks with incomplete stories. One was owned by Dime & Dollar Savings and Loan from 1924 to 1931 in Seattle and we have no other evidence of it. That clock likely came from either Seattle Jeweler L. W. Suter who had a similar clock from 1912 to 1924 or from a clock at the Aberdeen branch of Burnett Brothers which was there from 1911 to 1921. We know the Lakewood clock was owned by Provident Loan Company in 1957. We have good records for installations during the 1930s, and none have turned up after a 20 year blank, so it's highly unlikely that the Dime & Dollar clock became the Provident Loan clock. Like the Dime & Dollar clock, many Seattle's street clocks disappeared during the Great Depression. It probably was scrapped. The only other clock that matched Provident Loan was at the Seattle branch of Burnett Brothers. Burnett had their clock until about 1955, and didn't have it when Provident Loan installed their clock in 1957. Provident Loan was two blocks away at 4th and Seneca. With the dates and locations so close, it seems clear that this is the same clock. Provident Loan Company had the clock at 411 Seneca Street until 1979. In 1977 the Seattle City Council enacted ordinance 106348, which established a landmark process. Along with landmarking important buildings and other civic features, the City of Seattle embarked on a thematic designation of all remaining street clocks. Initially 11 clocks were identified. But by the time they were officially landmarks in October 1980, there were only ten clocks. The clock at Provident Loan Company was gone. Apparently unaware that there was a landmark effort afoot, Arthur W. Henry removed the clock. Arthur was great grandson of Horace C. Henry, an important figure in Seattle history after his arrival in 1890. Horace Henry, among many other ventures, was president of the Provident Loan Society. Provident Loan started in 1910 in the White-Henry-Stuart Building, formed by Horace Henry. It was a member of the National Federation of Remedial Loan Associations, all modeled on New York's Provident Loan Society. That was formed in 1893 to provide low interest pawn loans to the poor. In about 1915 Provident Loan relocated to 411 Seneca. Two of the other three officers of Seattle's Provident Loan were Horace's sons: Langdon and Paul. Langdon was Arthur's grandfather. The clock was in Woodinville at the yard of West Coast Construction Company from December 1979 to at least September 1980. Norton Clapp then moved the clock to his estate on Orcas Island in late 1980. It stood on Orcas Island for almost two decades, hidden from the public eye it was meant to serve. 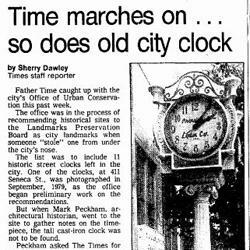 Norton Clapp had the clock restored and moved it to Lakewood to his commercial property Colonial Center in 1998. Strangely, every building that Burnett Brothers' clock was at in Seattle has been destroyed. The site of Provident Loan at 411 Seneca is now the W Hotel. The White-Henry-Stuart Building was demolished and its site is now Rainier Square. The site of Burnett Brothers' final location at 4th and Pike is now Century Square, an office tower with commercial podium. The previous location at 1316 2nd was an empty pit in my first memories of downtown Seattle and is now Benaroya Hall. Another location at 909 2nd, the Burke Building was demolished and replaced by the Jackson Federal Building. Its first spot in Seattle at 720 1st is now a parking garage.